Christian Gruber and Peter Maklar, two dedicated and idealistic ambassadors for the classical guitar, have been playing together for 30 years and have long represented one of the pre-eminent ensembles on the international guitar-music scene. Composer Dusan Bogdanovic says of them: “This duo is the best that guitar chamber ensemble can offer today.” And the Süddeutsche Zeitung wrote after one of their concerts: “This is how one imagines benchmark performances.” Their successful concert career took off when Gruber and Maklar won first prize in the International Guitar Duos Competition in Montélimar/France in 1991. Numerous concert tours have taken the Duo to almost all countries in Europe, as well as to Mexico, Chile, Martinique, Canada, USA, Russia, Japan, and South-Korea. Christian Gruber and Peter Maklar have been guest performers at such famous venues as the Manhattan School of Music in New York, the Moscow Philharmonic Society´s Tschaikovsky Concert Hall, Gendai Guitar Hall in Tokyo and Amsterdam´s Concertgebouw. The Duo maintains artistic partnerships with the Japanese singer Tomoko Nakasugi, the oboist Christoph Hart¬mann (Berlin Philharmonic Orchestra), the violinist Key-Thomas Märkl (Bavarian Radio Symphonic Orchestra), Bavarian Radio´s announcer Alex Dorow and the internationally famed guitarists Tilman Hoppstock and Dimitri Illarionov. 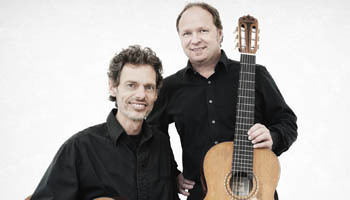 Since 2009 Duo Gruber & Maklar has made regular guest appearances with the Amadeus Guitar Duo. Since 2008 they have been organizers of “Festival Faszination Gitarre” in Landsberg am Lech/Bavaria, a course for over 70 participants with internationally renowned artists and workshops.